R.S.C Anderlecht are a Brussels based first division side in Belgium. A quite impressive fact about the Belgian team is that they have finished inside the top six of the top division since the 1946/47 season. In Football Manager they are often renowned for producing high potential Belgian players. Think Romelu Lukaku of FM09-11. This year they have wonderkid Youri Tielemans in their squad and will be relying on their talisman to help them achieve their media prediction of 1st in the Pro League A. 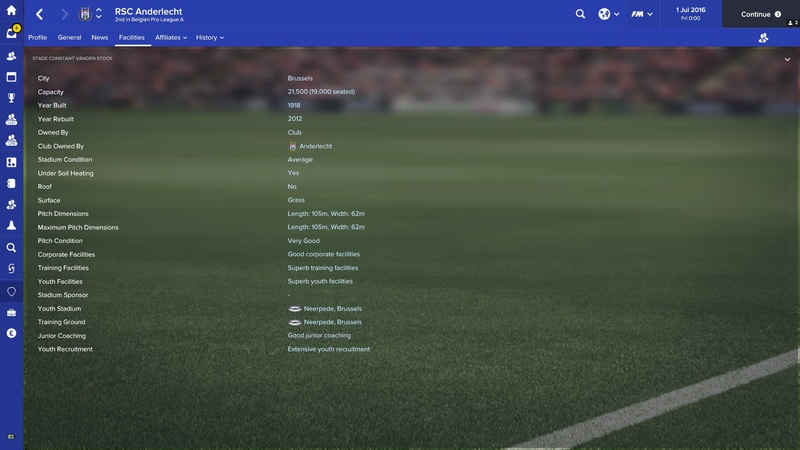 The following post is an overview of the club should you choose to take them on in Football Manager 2017. Go on, be someone new! FM wonderkid Youri Tielemans starts off FM17 with Anderlecht. Use him well. 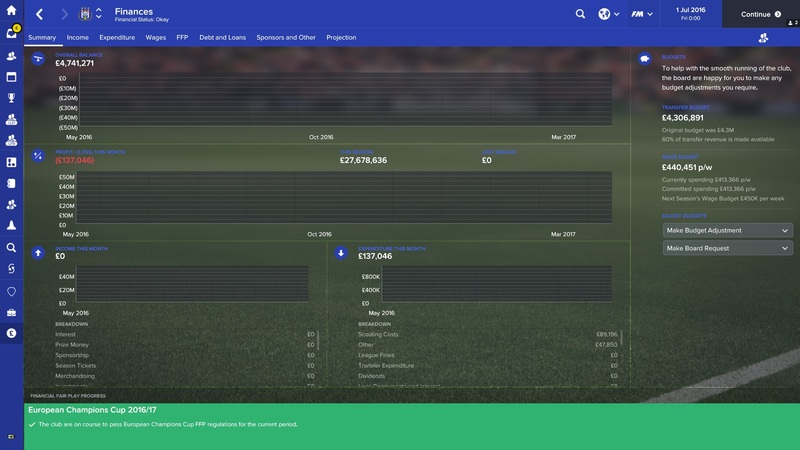 You may only get a season or two out of the youngster before he moves on for big money. The advanced playmaker can play most roles in the middle of the park and could be the player to build around. Luke (for short) is on loan at Anderlecht from Dynamo Kiev. The Polish striker is fairly adept at being either an advanced forward, complete forward or target man up top and could well prove to be a shrewd loan signing for your team. But remember, he is a loan player. It might make sense to look for another striker for your side moving forward. Kara can be your rock in defence. His physicals will help him win the majority of aerial battles as will his strong heading attribute. He is also a leader and could make the perfect captain to lead your squad. Ghanaian attacking midfielder Dauda Mohammed has a good level of potential and could prove effective late on in games with his extra pace. However he will need to improve his passing, decisions and vision if his wishes to be played in the centre of the park. Defensive midfielder Doumbia could be the star of your side moving forward. He’ll never be too much of a threat in attack, but he has potential to be a rock in front of your defence. Keep an eye on his natural fitness, it may take him longer to recover after matches. The final player we will look at is another defensive midfielder. Like Doumbia, Leander Dendoncker is a defensive midfielder who could help to solidify your defence as you look to win the Belgian Pro League. 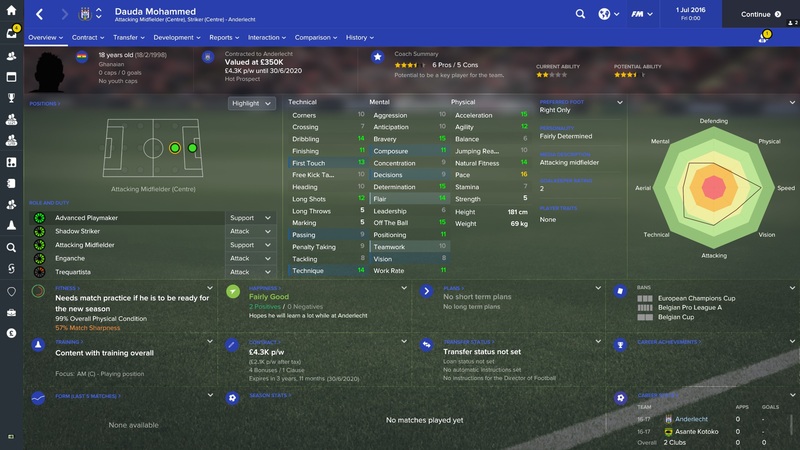 He has potential to develop, but aged 21 he will need first team football now to reach it. Champions League qualification is almost a must for Anderlecht. Financially they are okay, but the added revenue of Europe’s biggest competition is essential. Make sure that you reach the group stage! With Anderlecht, the goal is to turn them into a European force. It has been almost three decades since their last European CL Quarter Final and they have never reached a final. Be the manager to do it. Belgium have great youth players that come through their youth systems each year. Take advantage of this and build an unbeatable Anderlecht squad. Thank you for reading our club guide to Anderlecht. I hope it may have inspired you to begin a save with the Belgian club. If you enjoyed this post, please do feel free to share it around on social media and follow our accounts through the links above. If you have a club that you would like to see a guide for, leave a comment below! This entry was posted in FM Guides, FM17 Guides, Experiments & Wonderkids, Football Manager 2017 and tagged anderlecht, belgian pro league, belgium, dauda mohammed, europe, FM Guides, fm17, football manager, idrissa doumbia, kara, leander dendoncker, lukasz teodorczyk, youri tielemans. Bookmark the permalink.